The Wave…of American Flavors Discovery Dinners continue in January by celebrating our Central Florida Strawberry season. Our Farmer/Chef dinner will feature Lott Farms located just west of Plant City, Florida. Mike and Sandy Lott started their farm in 1979 on rented land and purchased and built their family farm of 50 acres in 1983. They have lived on and farmed this land with their children and grandchildren since that date. Mike’s great strawberries are sold under the Classic label through C&D Produce Distributors. For reservations, e-mail WDW.Tables.In.Wonderland@disney.com with the following information: your interest to book, your name, daytime phone number, home address, and the number of people in your party. You will be notified on a “first-come, first-served” basis. Your credit card will be taken over the phone once your reservation is confirmed. The event is limited to 40 Guests. 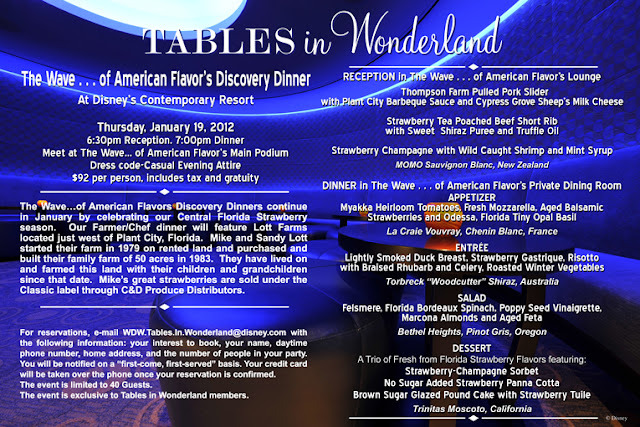 The event is exclusive to Tables in Wonderland members.